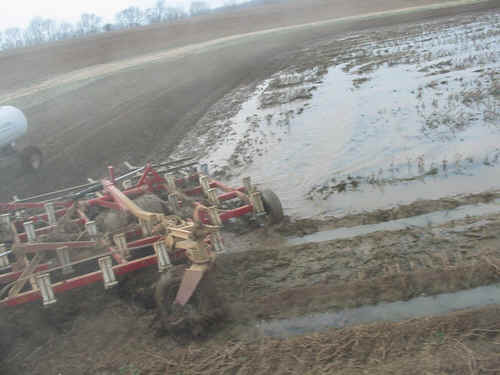 It is important to prepare the ground before planting. 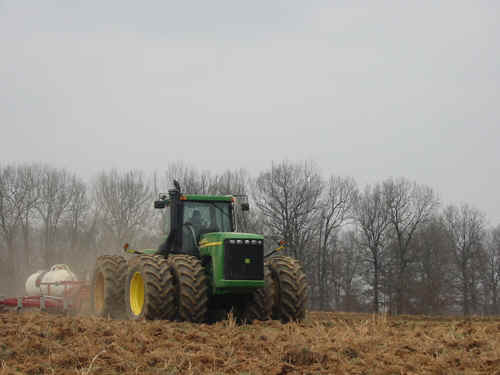 Fertilizers help energize the ground for the spring planting. 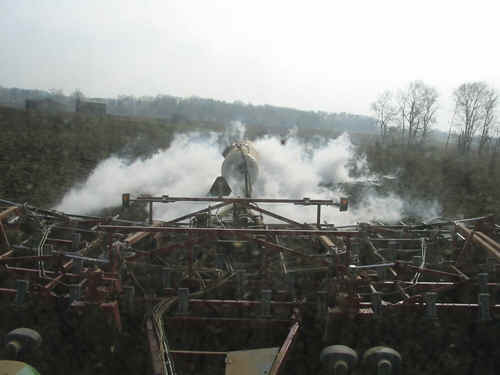 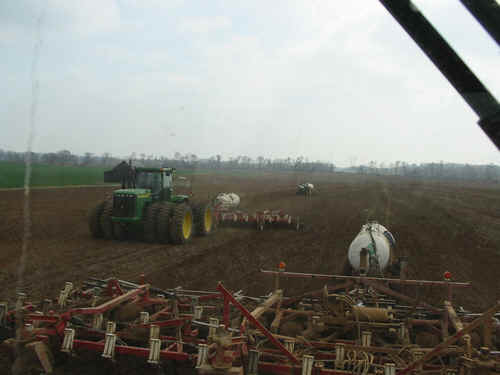 One of the most popular forms of fertilizer in the American mid-west is anhydrous ammonia (NH3). 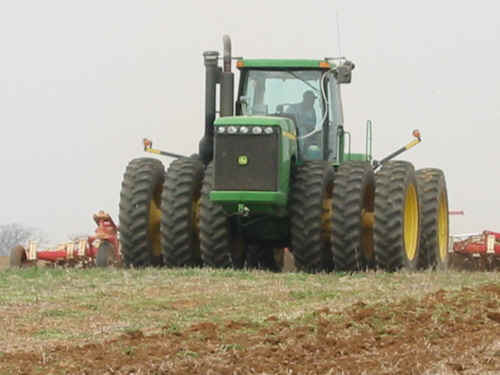 American farmers will spend up to $1.5 billion on nearly five million tons of NH3 for the 2003 crop. 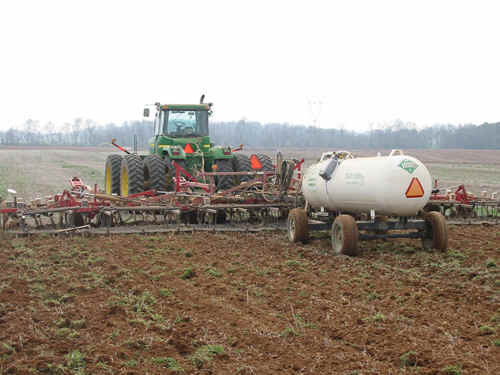 Understanding the properties of NH3 is important for proper application. 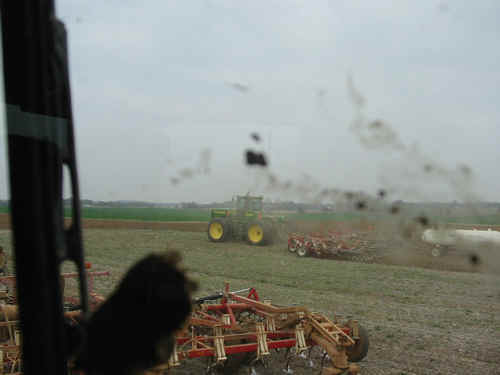 When applied in the field, the physical properties of NH3 (unlike liquid sprays or solid granules), undergo constant change. 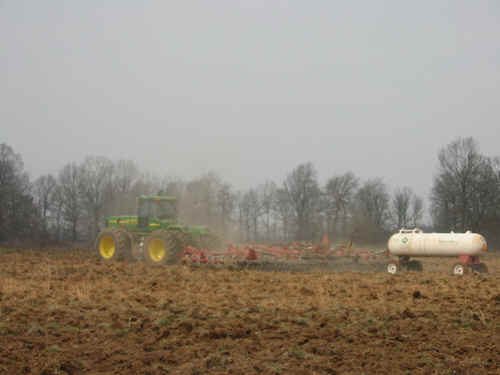 NH3 contains 82 percent nitrogen and 18 percent hydrogen, and it begins to boil at -28�F, so it must be stored as a liquid, under pressure. 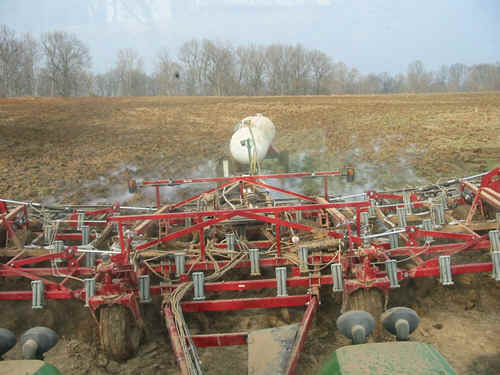 Each pound of NH3 that vaporizes is capable of freezing about 4 pounds of water. 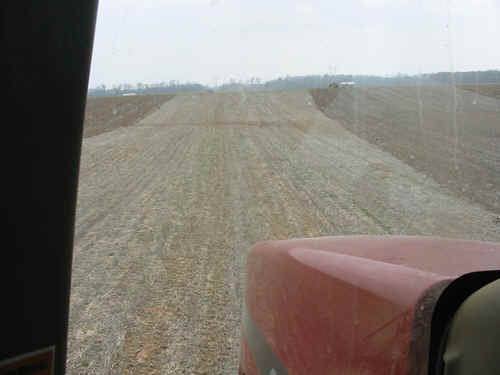 Such extreme physical properties make NH3 a challenging product for producers to handle and apply accurately and evenly, or in precision farming environments. 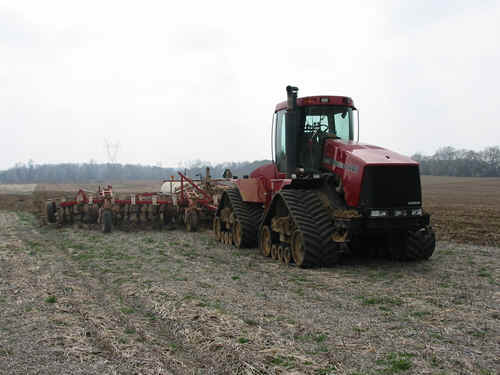 Big Tractor Power visited Garnett Farms of Hopkinsville, KY to see big iron apply NH3. 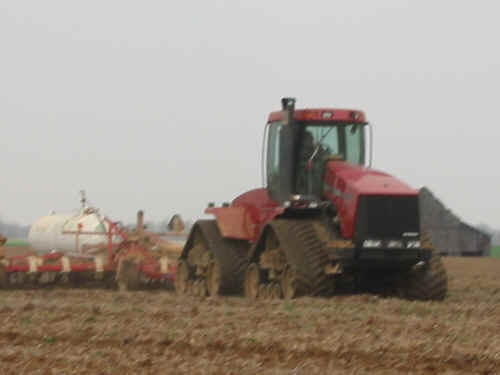 Garnett Farms of Hopkinsville, KY use 4wd tractors to apply enough anhydrous ammonia to raise a 2003 corn crop of 8,500 acres. 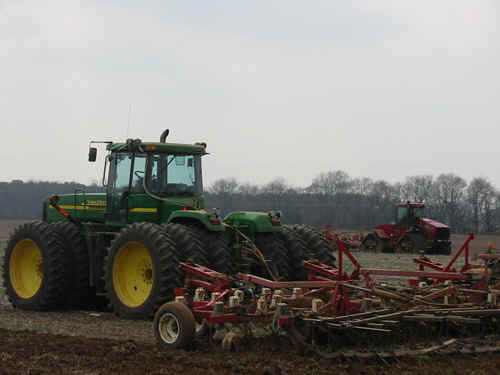 The Garnetts' NH3 application fleet includes a 2003 John Deere 9520 on metric duals, a 2002 John Deere 9520 on triples, a 2001 CaseIH Steiger STX 440 Quad-Trac and 2000 John Deere 9400 on triples. 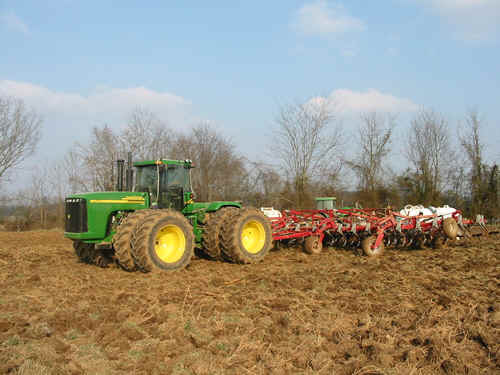 These 4wds ranging from 425 hp to 450 hp pull 42ft 5 section Wil-Rich field cultivators. 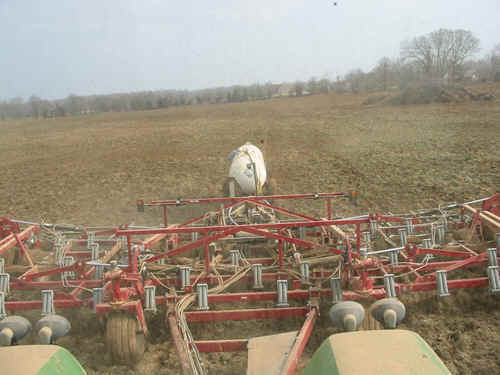 The Wil-Rich Quad 5 is best suited for the Garnetts needs because each shank has 220 pounds of down pressure and can till the soil while applying the NH3. 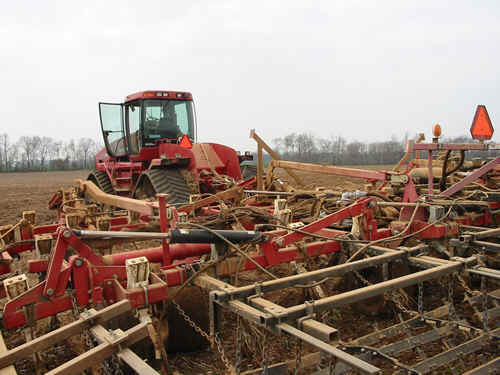 These massive tillage tools are set to apply the NH3 gas on the two rear rows of shanks as the front 3 rows break the ground ahead of application shanks. 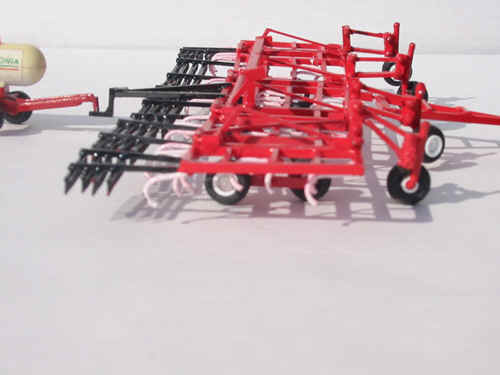 Anhydrous wagons from the local fertilizer dealer Agri-Chem will cover on average 17.2 acres towed behind the big Wil-Rich field cultivators. 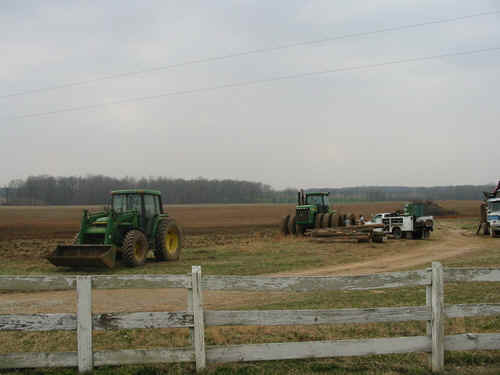 A 2002 John Deere 5220 and 2001 6410 shuttle the anhydrous wagons from the road to the field cultivators. 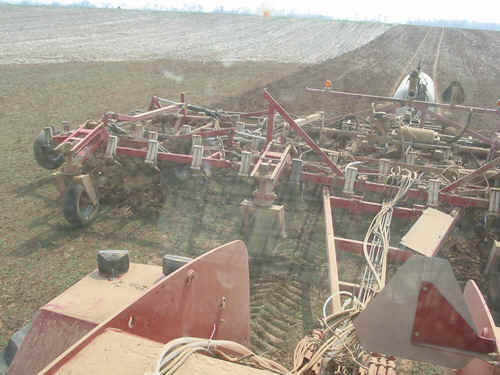 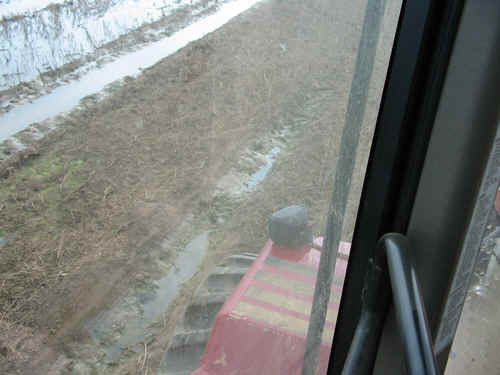 This shuttling allows for little down time and almost constant tillage. 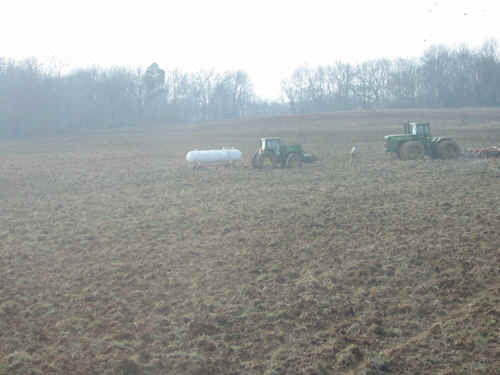 On the day BTP visted Garnett Farms the NH3 Application fleet was working in two locations. 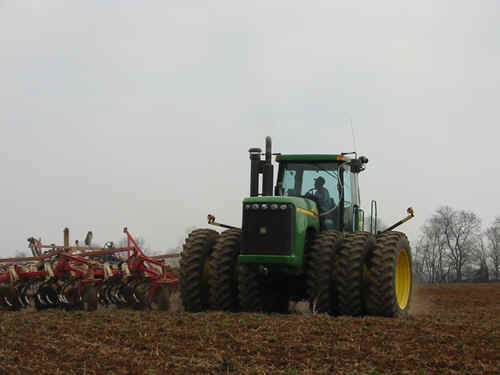 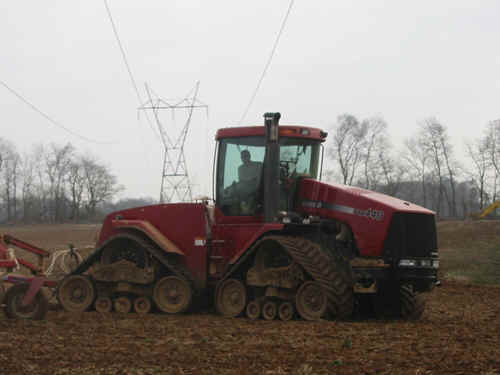 The John Deere 9520 on triples and the CaseIH STX 440 Quad-Trac were working in a 150 acre field turning under last years bean crop's stubble. 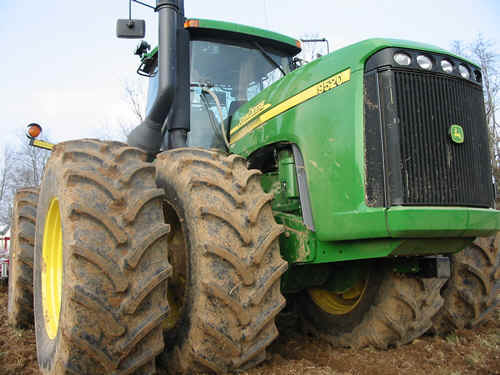 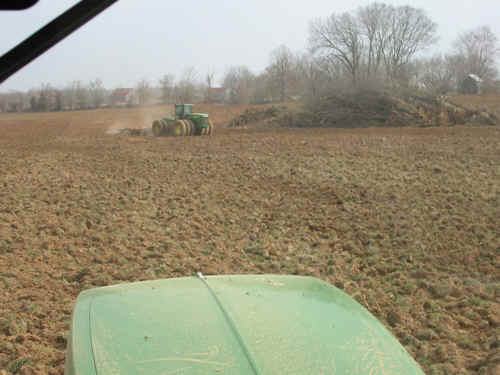 The other team consisting of a John Deere 9520 on metric duals and 9400 on triples were working on a new 210 acre farm that had been mostly pasture land. 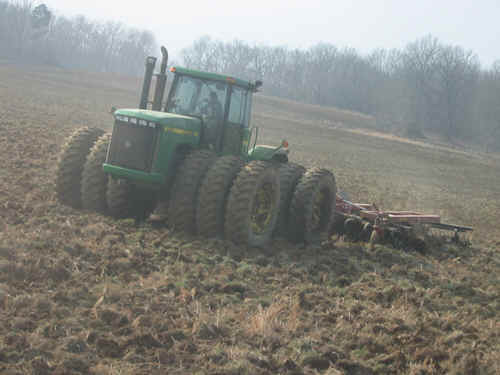 An additional 9400 on triples pulling a 32ft Sun Flower disk worked ahead of the NH3 4wds on this farm to break up the new fields that were covered by rough clods of sod and roots. 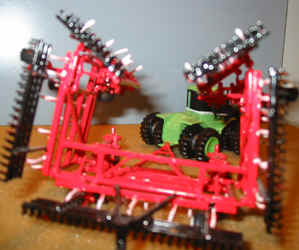 Gordy Schultz a 1/64 custom toy builder has built a 1/64 Wil-Rich Quad-5 just like theGarnetts use. 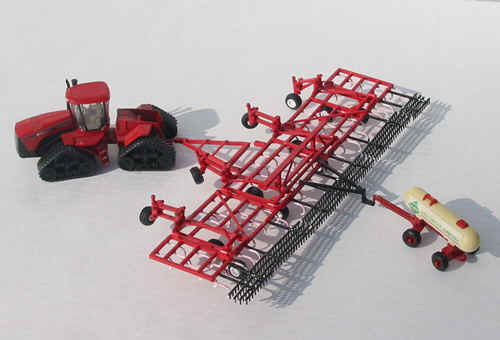 It looks right at home behind an Ertl CaseIH STX 440 Quad-Trac or John Deere 9420 on triples. 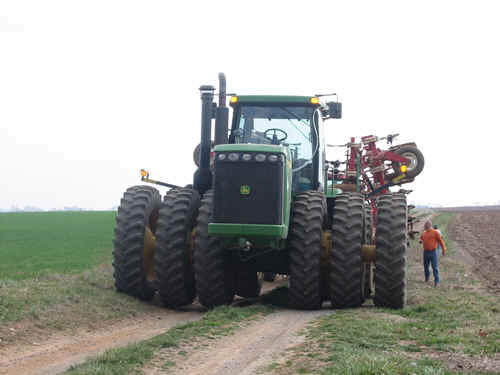 Click a thumbnail to view a full size picture.